Each frog has a sweet smile and fluttering lashes. The set also comes with its own little green table that doubles as an umbrella stand. Best of all, the set comes with a large floppy green umbrella that is designed to look like a friendly frog. Friendly eyes pop up from the top of the umbrella and the frog has an irresistable crooked smile that is sure to make kids laugh. To help keep children safe, this set features sturdy steel construction and each chair comes with a safety lock to prevent accidental folding. Each chair is 14.17 inches long, 14.17 inches wide and 19.68 inches tall. The table is 19.68 inches around and the umbrella is 41.33 inches in diameter. Family get togethers are about to get a lot more fun with the Sunjoy Frog Kiddy Bistro Set. Seat the kids at this bistro set so that they feel like they are part of the festivities, but still have a fun and special place of their own. 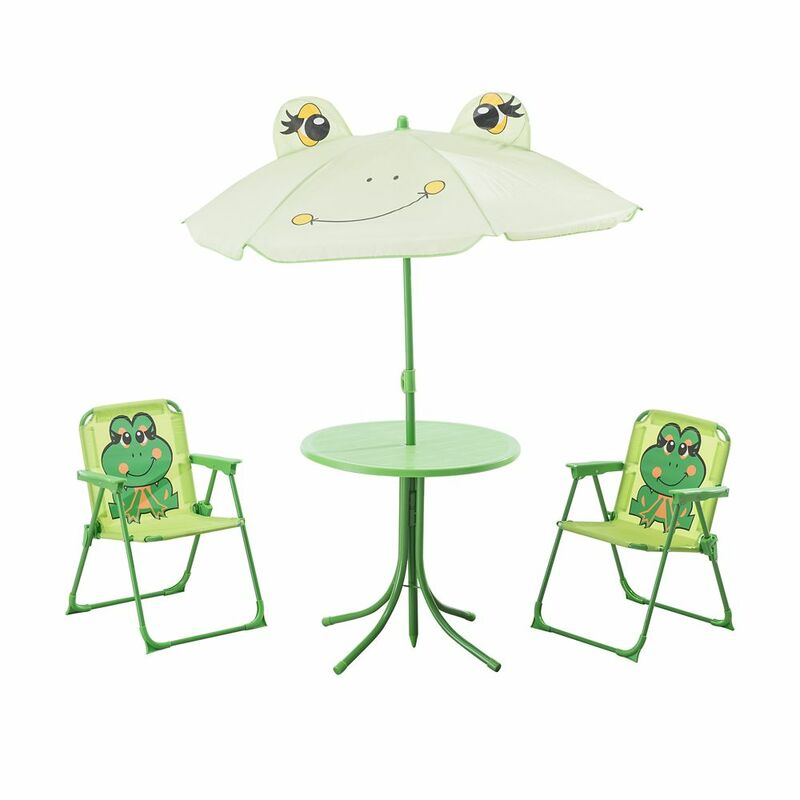 This fun bistro set comes with two bright green folding chairs that each feature an adorable frog on the back of the chair. Design the outdoors in this contemporary extra long Sofa with Chaise Patio Set by CorLiving. Featured in our Textured Black Weave and accented with Dove Grey cushions this versatile set is perfect for all of your summer entertaining. Made with UV resistant resin rattan wicker, water repellent cushions and a durable steel frame this product is ready to withstand the elements of the outdoors. Transform the configuration to suit your needs. Enjoy your outdoor space with the Hampton Bay Ellon patio furniture set made with beautifully hand-woven wicker and durable steel furniture frames. The patio chairs and loveseat boast deep, plush weather resistant cushions for ultimate comfort and longevity. The coffee table has a tempered glass inset and handy bottom shelves for extra storage. Perfect for your porch, patio or sunroom, each patio furniture set includes two lounge chairs, one loveseat and one coffee table. Happy Frog Bench Patio Furniture Each frog has a sweet smile and fluttering lashes. The set also comes with its own little green table that doubles as an umbrella stand. Best of all, the set comes with a large floppy green umbrella that is designed to look like a friendly frog. Friendly eyes pop up from the top of the umbrella and the frog has an irresistable crooked smile that is sure to make kids laugh. To help keep children safe, this set features sturdy steel construction and each chair comes with a safety lock to prevent accidental folding. Each chair is 14.17 inches long, 14.17 inches wide and 19.68 inches tall. The table is 19.68 inches around and the umbrella is 41.33 inches in diameter.